HedRush Music in partnership with the DC Commission on the Arts and Humanities Pulse DC, One Mic Presented by The John F Kennedy Center for the Performing Arts, Hip-Hop Theater Festival/HI-ARTS and Heineken present the 9th Annual J Dilla Tribute Concert and Fundraiser. On Thursday July 17, 2014 J Dilla fans from across the globe will join together to celebrate the life of a legend at the 9th Annual J Dilla Tribute Concert and Fundraiser, also known as DC Loves Dilla. The event will take place at the historic Howard Theater located at 620 T St NW, Washington, DC. Doors open at 8:00 PM. The 9th Annual J Dilla Tribute Concert and Fundraiser will not only feature a dynamic talent line up, but an exciting announcement from the Smithsonian’s National Museum of African American History and Culture. Opening the show will be DC’s home grown talent Kokayi, RA the MC, Maimouna Youssef, Awthentik,Laelo, Kaimbr, Gods'Illa, Asheru & Hezekiah. The 2014 headline performers are Phife Dawg, N'dea Davenport, Bahamadia, who is making a rare performance in the U.S. and Pharoahe Monch. Phife Dawg is one third of the dynamic trio A Tribe Called Quest. ATCQ was one of the first Hip-Hop groups in the 90's to achieve worldwide success. Phife continues to produce music that hits in the lives of a new generation of music listeners. In January of this year Phife released a single titled “Dear Dilla” to revive and celebrate the life of J. Dilla. N’dea Davenport is a recording artist and producer, best known for her work as a vocalist in the UK band The Brand New Heavies. N’dea will be traveling halfway across the globe to perform at the J. Dilla Tribute Concert. Bahamadia, known as the reigning Queen of Hip-Hop, rose to royalty through popular underground and commercial success beginning in 1993. Over the years Bahamadia has managed to balance her underground prominence with commercial success and has expanded her global fan base from Japan to Europe and across the USA. Bahamadia is currently working on her first EVER project of its kind “Dialed Up.” Pharoahe Monch set the rap game a blaze with his first album Internal Affairs in 1999. Known for his complex lyrics, delivery, and multisyllabic rhymes schemes Pharoahe Monch re-emerged with a new concept project which finds the ground-breaking emcee tackling his fourth project PTSD-Post Traumatic Stress Disorder. James “J Dilla” Yancey was a GRAMMY award-winning producer who inspired millions with his music including artist like Common, Raekwon, Erykah Badu, Mos Def, Talib Kweli, A Tribe Called Quest, De La Soul, and many many more. On February 10, 2006 just three days after his 32nd birthday, J Dilla passed away after a long time of suffering with Lupus. Cultural Curator Munch Joseph and HedRush Music created the DC Loves Dilla movement as a way to celebrate J Dilla and honor his career works. "Carrying on the musical legacy of J Dilla for the 9th year and counting is something HedRush and myself look forward to. Personally, it's my way of paying homage to a great creator as well as doing our part to continually add balance to urban music. Dilla's music accomplishes that on many levels," says Munch Joseph when asked the motivation behind the Tribute Concert ad Fundraiser. For tickets and more information about the J Dilla Tribute Concert and Fundraiser, please visit: www.dclovesdilla.com. 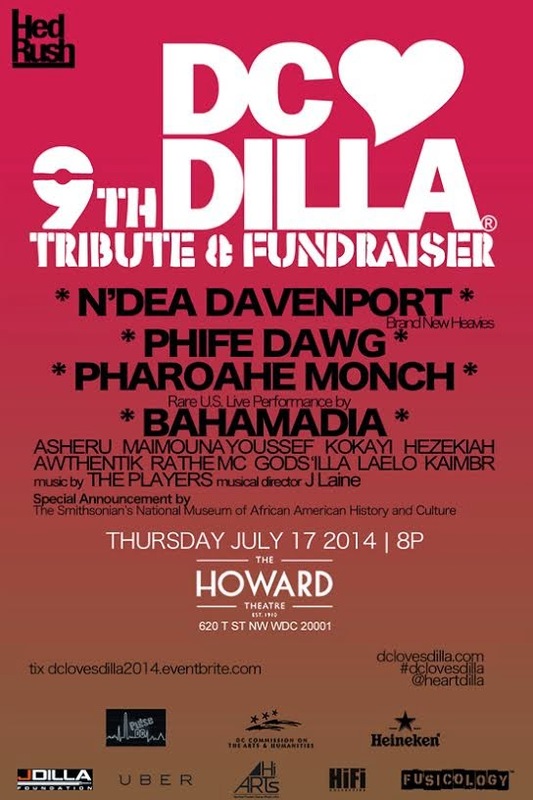 Proceeds will benefit the J Dilla Foundation and The Lupus Foundation of Greater Washington D.C.